SHARED MEMORY(IES): CREATION, RESEARCH AND POLITICS IN THE EUROPEAN CONTEMPORARY STAGE. The II EASTAP Conference (European Association for the Study of Theatre and Performance) will take place at the School of Arts and Humanities of the University of Lisbon and the National Theatre D. Maria II on the 23rd, 24th and 25th of September 2019. The theme proposed for debate is Shared Memory(ies): creation, research and politics in the European contemporary stage. The working of memory has been an object of inquiry by history, cognitive science, psychoanalysis, linguistics, literature, cultural and performance studies, sociology. In other words, by the sciences that aim at understanding how we process our experience in the world. Memory, associated with conservation and access to knowledge, is materialized through mnemonic devices that Frances Yates (1966) showed always connect space and the sum of knowledge. This was done, for example, in the 16th century, by the memory theatres of Giulio Camillo and Giordano Bruno. Today, the mass of information (big data) and the connection of objects online (internet of things) have us facing the same need to understand how and what we register from that mass of information within our reach, but especially the role played by memory in the configuration of individual and collective identities. Throughout the last century, we talked about collective memory (Halbwachs, 1925), memory theatres (Banu, 1987), memory-habit (Connerton, 1989), memory locations (Nora, 1984-1994). More recently, following the debates about the Holocaust, we talked about incorporated memory (Taylor, 2003), post-memory (Hirsch, 2008) and memory as a continuous performative act (Schneider, 2011). These terms were used to describe processes which move us between past and present, community and individual, in a word, between specific types of performativity; between the apparent fixity of ritual and of celebration and the wandering so characteristic of memory, sometimes leaving traces and producing stratifications, other times selectively erasing. In this connection, memory industry and memory tourism have also been discussed (Traverso, 2005; Schneider, 2011). The obsession with the production and the use of archives, seen as repositories of experiences and knowledge to be reactivated, has also invaded the artistic field and governs the artistic practice as research. The quest to understand how memory works and what it represents for the individual and the collective of which the individual is a part, what it means to remember and to forget, has had consequences in the appreciation of certain human practices and representations: the production of life stories, photographic records of public and private acts, documentary cinema, the creation of archives and databases, the use of narrative in medicine, the construction of memorials and the celebration of certain monuments, in sum, the deletion, the uses and misuses of memories that excluded, revised or reinforced narratives accepted as dominant. On the one hand, we recognize the different amnesias of our times, the fear of robotization, of artificial intelligence, of expanded reality and the hologram. On the other hand, we are faced with the compulsive recording of our actions “for future memory”. Where can theatre and performance be situated in this problematic? As the art of memory? As a mnemonic device which makes a community temporarily remember together and, especially, produce memories and project memory in a space-time of sharing? The theatre memorabilia created for the pleasure of collectors is not the only expression (albeit the most evident one) of the modalities of the mnemonic recording and recovering of personal, cognitive and collective experiences of the theatre and the show. The topic of memory relates to theatre and the performing arts precisely through their performative dimension. We see how it acts on the power of testimony, on the material dimensions of the real, on the non-segregation of the private sphere from the public sphere, on the prevalence of the process that connects artists and spectators in the meeting/confrontation of memories. We can speak of a theatre perceived as a palimpsest that lets you see how and what is written, erased and re-written in the body-memory of the actors, but also on the body of those present, who rework and reforge their memories in permanence. The conference theme aims, therefore, to bring together diverse (inter)disciplinary perspectives (arts and performance studies, visual studies, cognitive sciences, social sciences, literary studies, cultural history), as well as to invite artists, that will be announced very soon, whose creative practice does not separate the three axes mentioned above. Thus, artists and researchers will be on an equal footing while discussing the theme and can present their points of view through communications, performance-speeches, interviews or commented audiovisual records of their work. Papers will be allocated 25 minutes on the programme (15 minutes for the paper and 10 minutes for discussion). The selection of panels/papers will be made by the Conference organizers in consultation with the Scientific Committee. The decisions will be made public by the 7rd June 2019. Languages of the Conference: English, French, Portuguese. Conference registration can be made until the 1st of July according to the guidelines explained at https://www.eastap.com/registration/ . Please, note that EASTAP registration is mandatory. création, recherche et politique sur la scène européenne contemporaine. What is the Theatre? is one of the most coherent and systematic descriptions and analyses of the theatre yet compiled. Theatre is, above all, spectacle. It is a fleeting performance, delivered by actors and intended for spectators. It is a work of the body, an exercise of voice and gesture addressed to an audience, most often in a specific location and with a unique setting. This entertainment event rests on the delivery of a thing promised and expected – a particular and unique performance witnessed by spectators who have come to the site of the performance for this very reason. To witness theatre is to take into account the performance, but it is also to take into account the printed text as readable object and a written proposition. 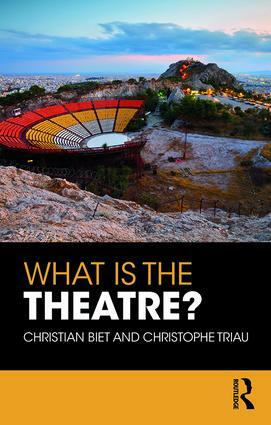 In this book, Christian Biet and Christophe Triau focus on the practical, theoretical and historical positions that the spectator and the reader have had in relation to the locations that they frequent and the texts that they handle. They adopt two approaches: analysing the spectacle in its theatrical and historical context in an attempt to seek out the principles and paradigms of approaching the theatre experience on one hand, and analysing the dramaturgy of a production in order to establish lines of interpretation and how to read, represent and stage a text, on the other. This approach allows us to better understand the ties that link those who participate in the theatre to the practitioners who create theatrical entertainment.